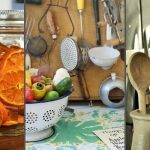 We often hear the terms “contemporary”, “modern”, “traditional” etc in home interior design to describe a specific style of rooms, furniture or home architecture. 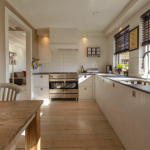 A contemporary kitchen design, which is the subject of this post, refers to kitchens that have clean simple lines and monochromatic color schemes but their style also incorporates elements from the traditional design area. Strictly speaking, “contemporary” means “current” or “of the moment”. In terms of interior design, a contemporary style can be modern but also can include design elements of other styles. In our gallery below you will find several stylish kitchen designs which can be characterized as “contemporary” but let’s not stick to naming conventions and terms. Just enjoy the designs and we hope you will get some ideas for your own dream home!! 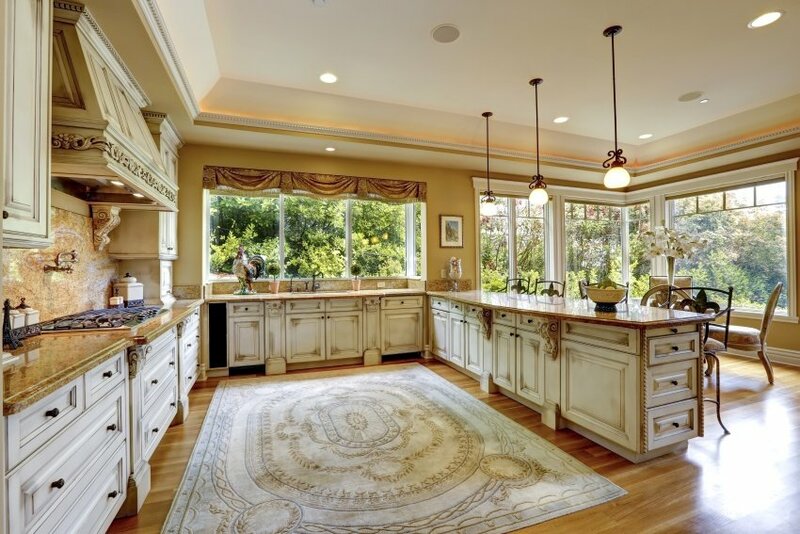 Soft carpeting is an unusual choice to lay the kitchen floor but it certainly adds a touch of comfort and warmth. 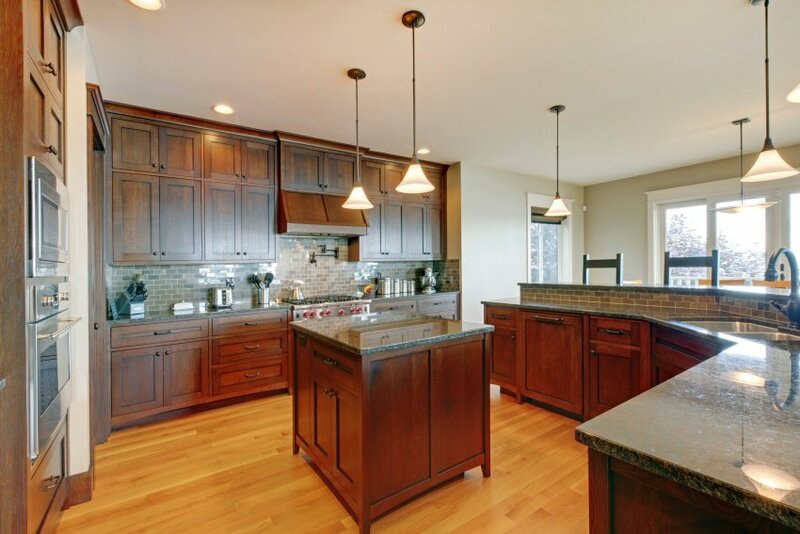 The kitchen cabinetry is with a classic look and topped with a speckled granite slab. Intricate details add the final touch to a spectacular design. Here is a fun way to add personality to a rather plain kitchen. The cow patterned table and benches in the center of the room grab your eye at once. They truly pop out in a space that is set in neutral tones and plain materials. This symmetric kitchen layout is developed around a central island counter that is aligned with a cooking range with a large hood above. Brick tiling is a creative way to decorate a backsplash, as it adds texture and character to a plain surface. 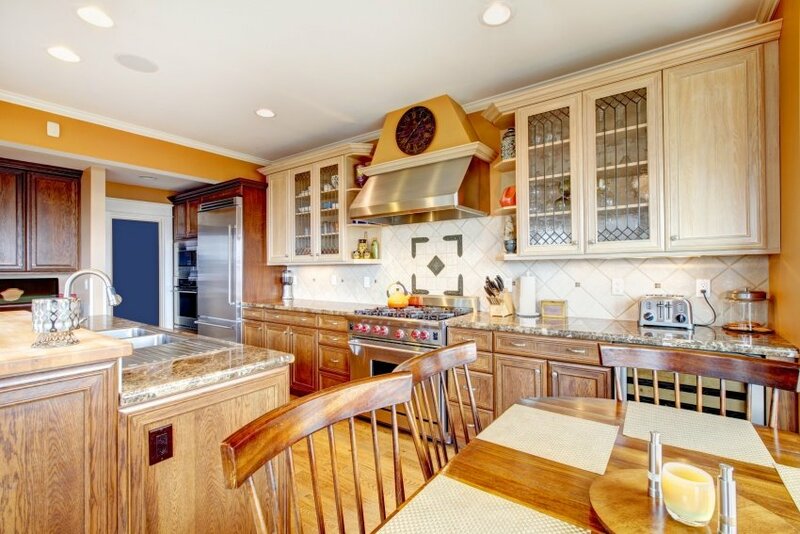 This vibrant kitchen with traditional cabinetry design and a diagonal tile backsplash looks amazing. Dark wood in key places draws the attention and adds a dash of contrast. 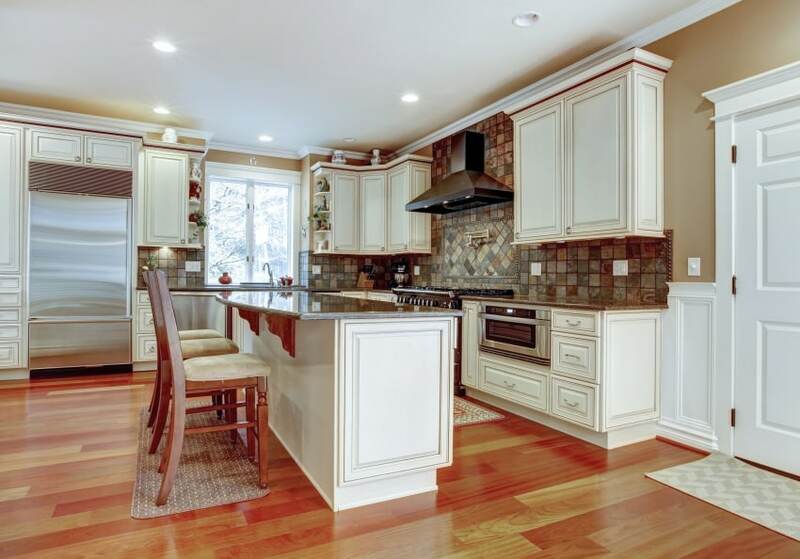 Speckled granite countertops in warm hues suit both colors of the wood cabinetry. A casual contemporary kitchen design is sure to make you feel right at home. This right here is a simple but appealing idea for a traditional kitchen. Light wood cabinetry, red wood floors and olive-colored walls come together in a beautiful combination. 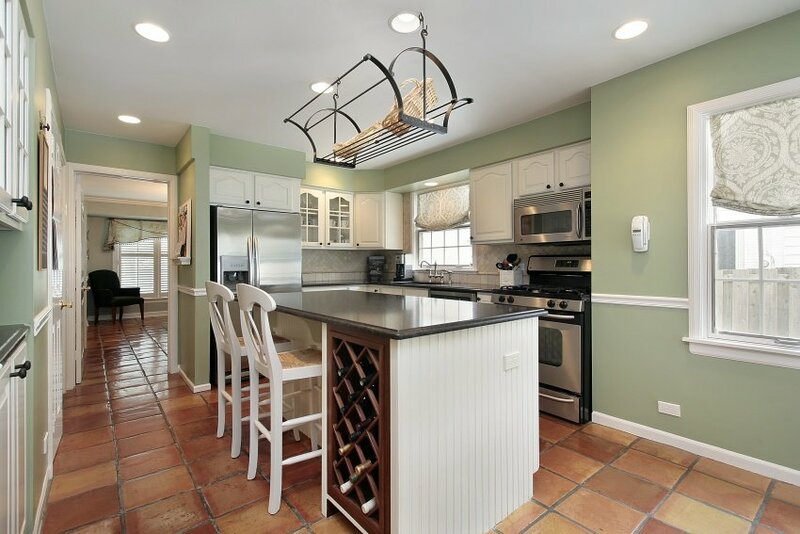 Terracotta tiles add warm colors to a kitchen design set in light green and neutral whites. This cozy little cooking space has a centrally positioned island counter with bar seating and a large rack for a private wine collection. Unusual color schemes in the interior are always a breath of fresh air, especially when they are as perfectly balanced as this one. 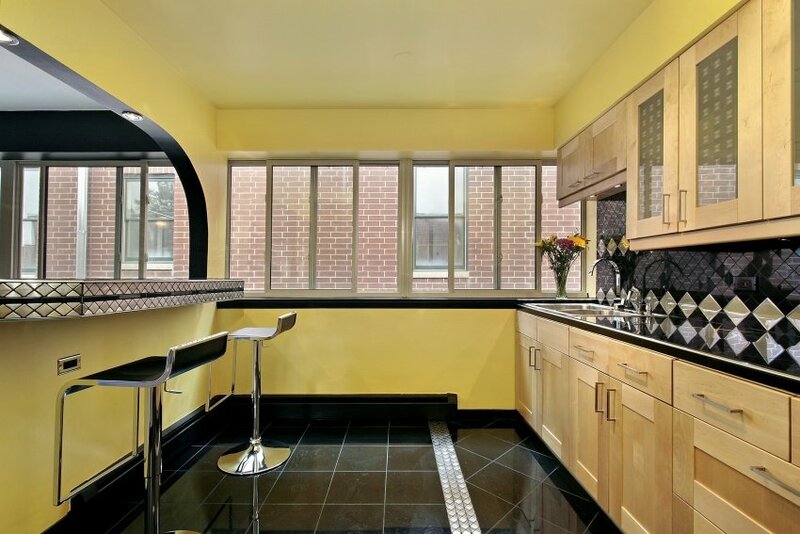 Here we have a black tiled floor, yellow painted walls and light wood cabinetry. Silver linings make a bold statement, while also being in harmony with the whole setting. 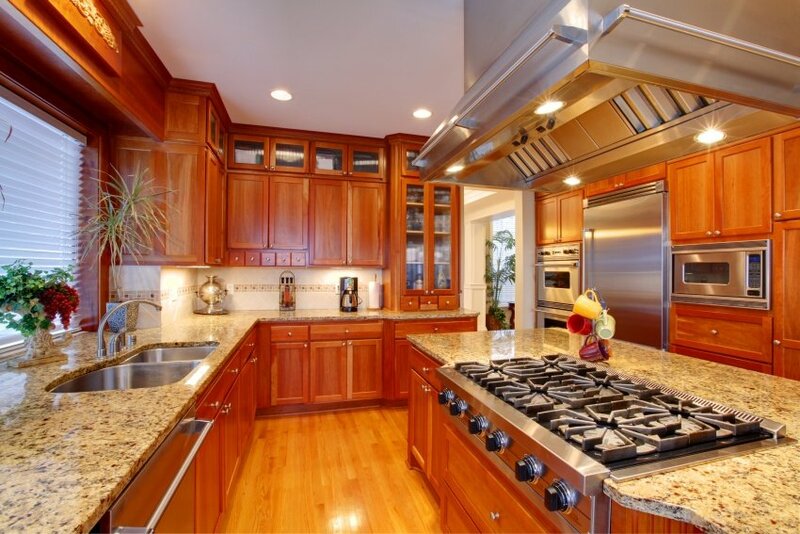 This traditional kitchen is the place to cook in style. 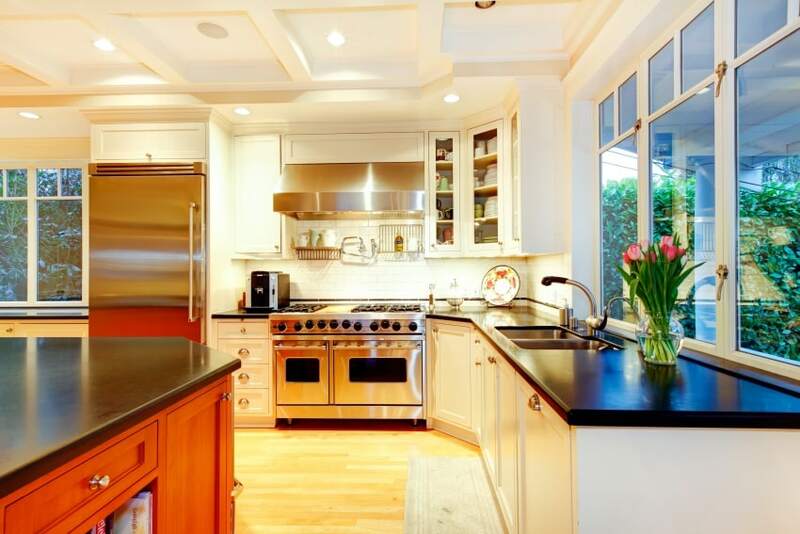 Ceiling-high cabinetry in an eggshell color closes on an island counter in black. 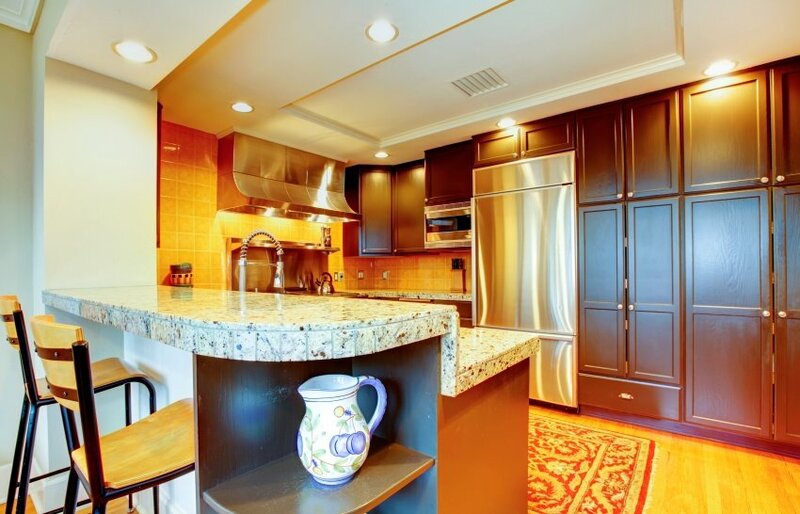 Speckled granite countertops and tiled backsplashes in grey suit both colors of the kitchen cabinets. This tiny modern kitchen corner fits lovely under a sloped roof. The highly unusual space is furnished with all amenities, built-in appliances and some eye-catching red-colored rugs. On top of it all, it has a nice look over the neighborhood to offer. Here is a more traditional design proposal with red wood floors and white cabinetry with speckled granite countertops. Floor-to-ceiling furniture is a great way to most efficiently utilize the space and get the most out of it. 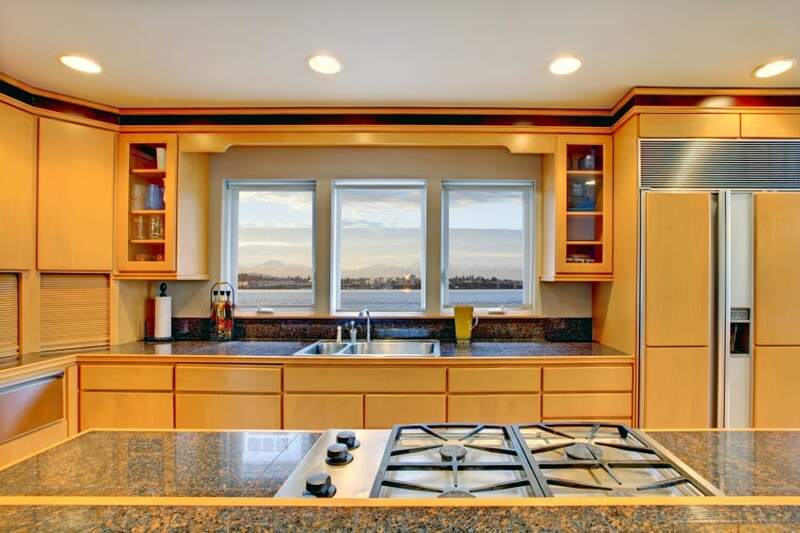 This contemporary kitchen space is furnished with minimalist design cabinetry and built-in appliances. The doors of the kitchen cabinets have a clean modern look and no handles. Instead, they are equipped with a touch opening system – an innovative solution for the modern home. 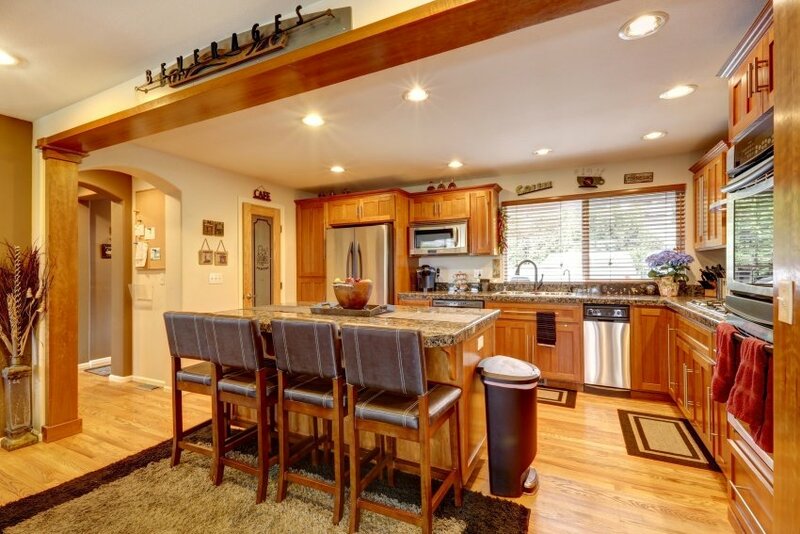 Enjoy a spacious kitchen layout with a central island counter. The dark red wood of the cabinetry contrasts to the light oak parquet flooring and pale wall paint. 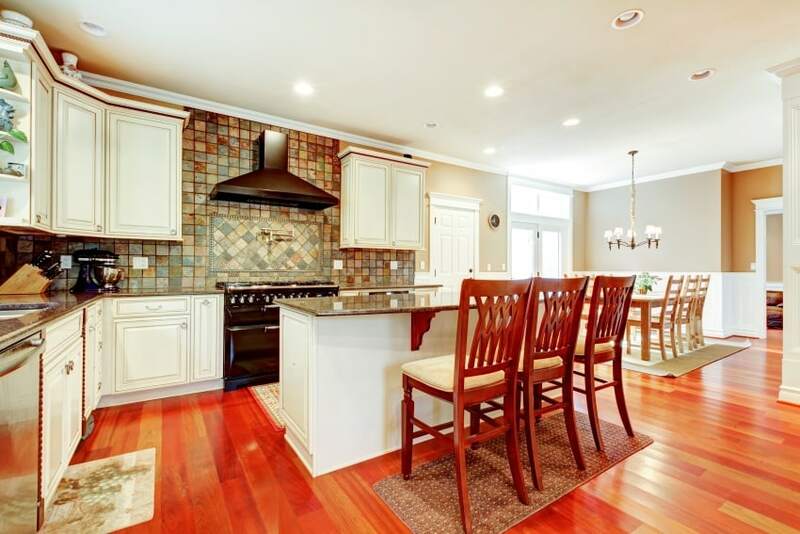 The dark granite countertops and brick backsplashes are also a beautiful match. 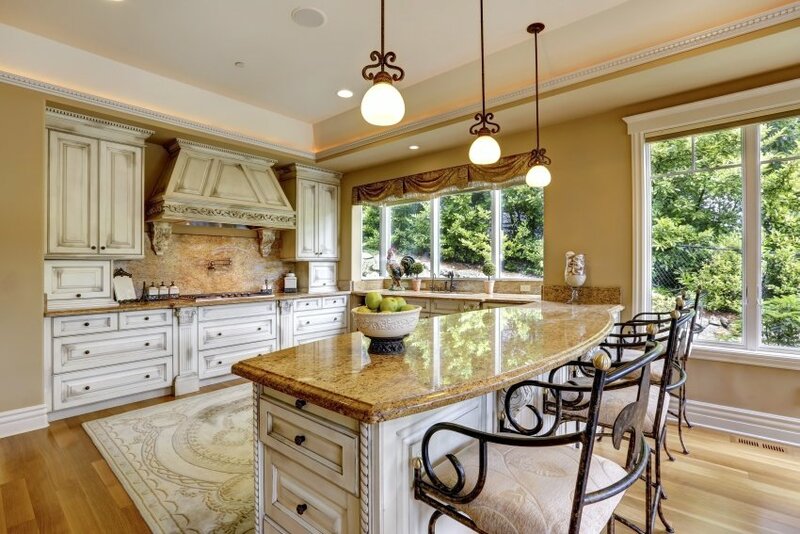 The classic cabinetry appearance meets the modern look of the built-in appliances in this traditional kitchen design that is set in the neutral shades of the color palette. Although plain in color, this design proposal is rich in texture – just take a look at the tiled backsplash and solid wood floor. Vibrant red floors would certainly bring life into any interior space. They are best matched with neutral colored furnishings, just as they are in this design idea. Cabinets in ivory and a backsplash in grey fit in the setting and build up an elegant and practical kitchen solution. Light-colored cabinetry blends in with the walls of this kitchen, thus allowing the red wood island counter in the center to really stand out. 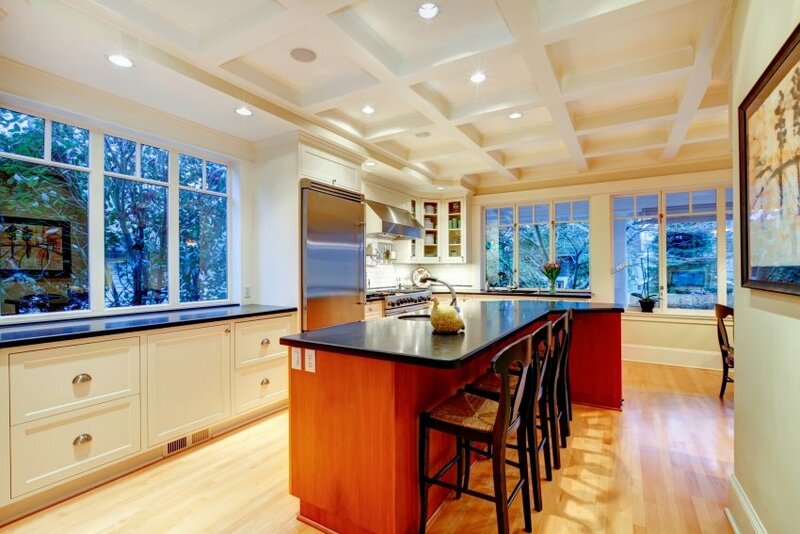 The coffered ceiling and large windows are a great addition to a classy cooking space. 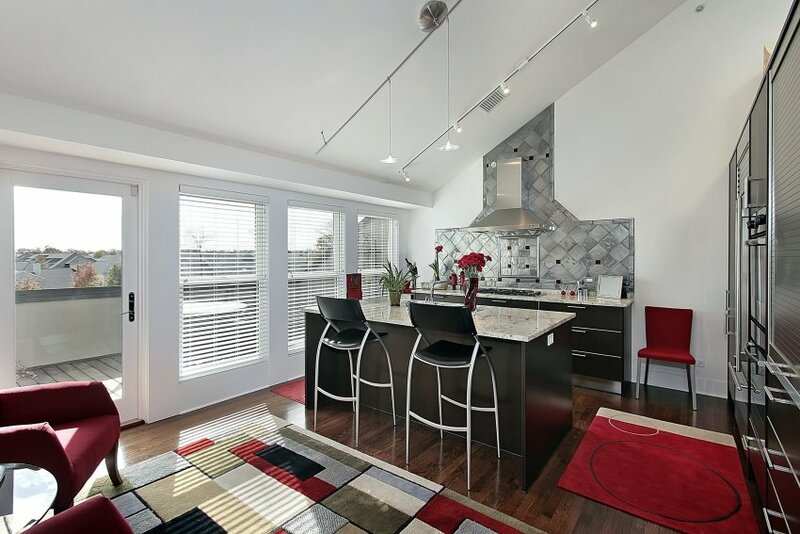 Black countertops suit both white and red wood cabinetry, and stainless steel appliances add shine and glamour. Large windows and plentiful lighting ensure that the whole space is well illuminated at all times. A multi-leveled ceiling brings in some character and a wow effect into a regular kitchen design. 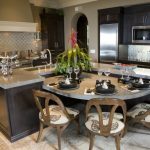 This layout includes dark wood cabinetry and a kitchen bar area, all topped with speckled granite in light grey. This kitchen idea is set in the warm hues of the color palette. Solid wood floors and orange walls are a spot on combination. 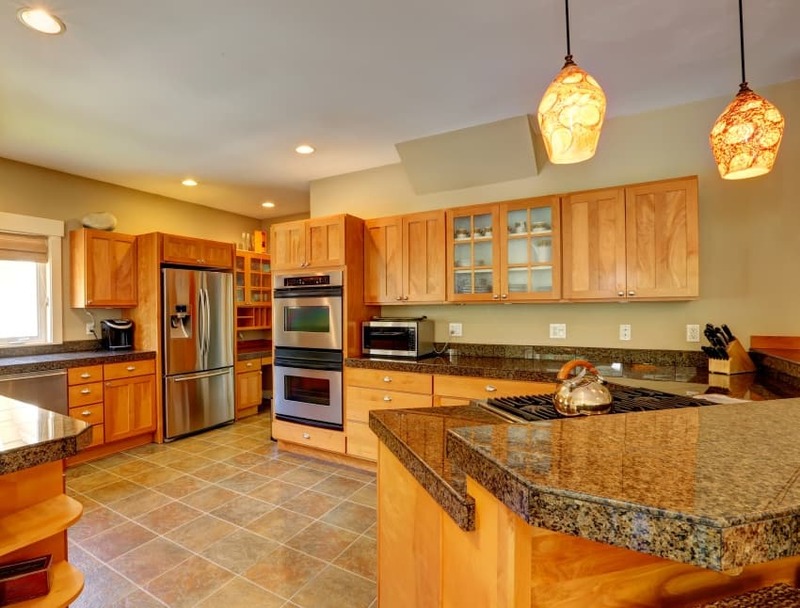 As for the oak cabinets and speckled granite countertops, they are a perfect match, as well. 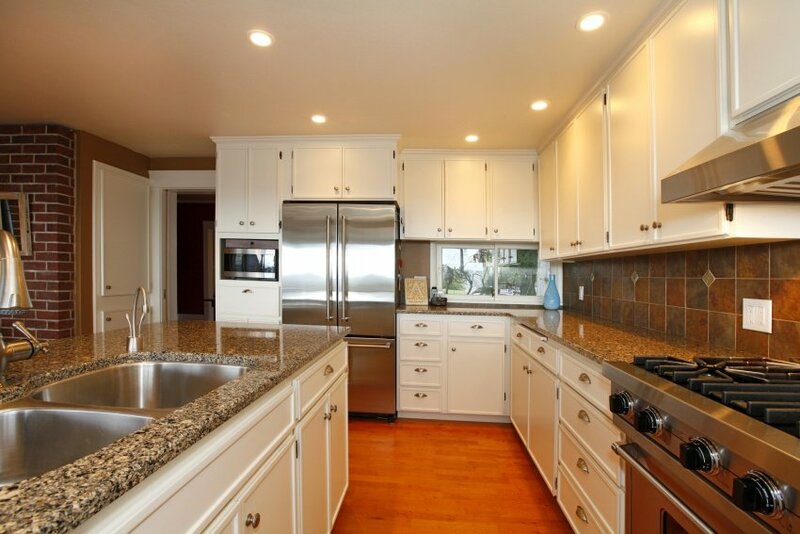 Kitchen base units and wall cabinets do not necessarily need to be of the same color. It is a creative idea to have some distinction between the two of them. 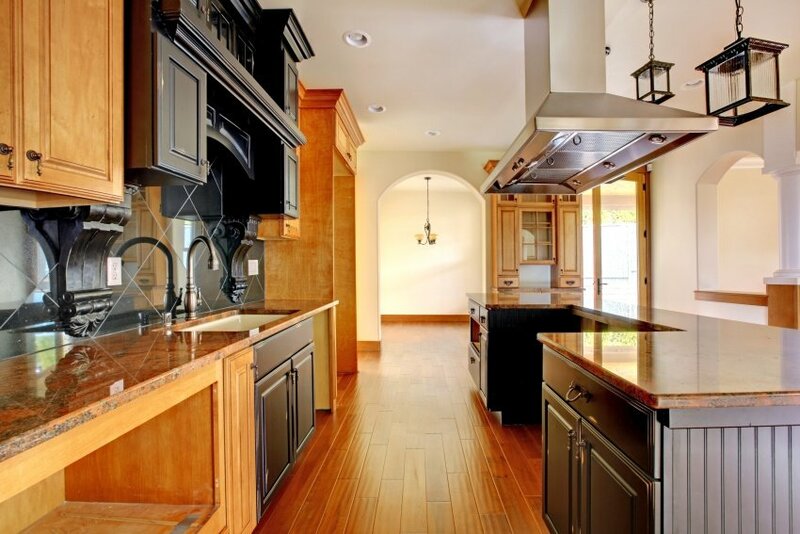 For example, in this image, the dark wood counters are combined with light wood wall units. 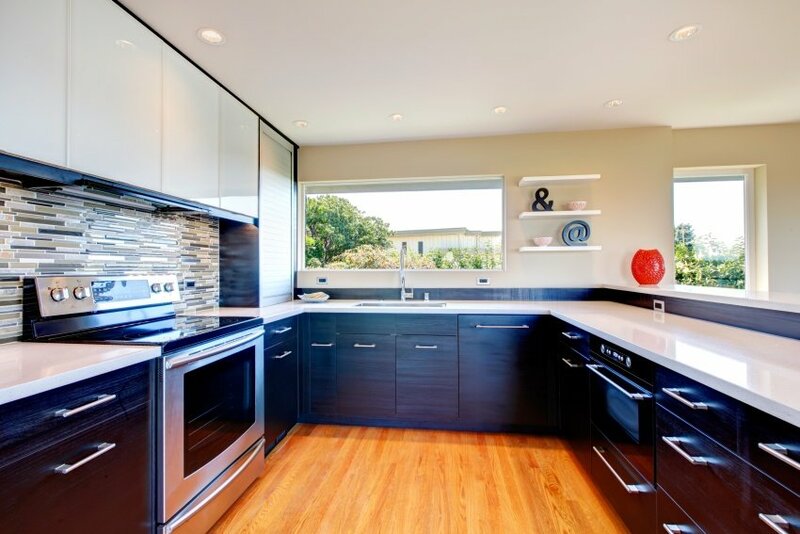 This modern kitchen design features clean lines and flat surfaces. Dark veneer and white gloss are in a beautiful contrast not only to one another, but also together to the bright orange wood floor. As for the grey tiled backsplash, it serves as a fine accent detail. 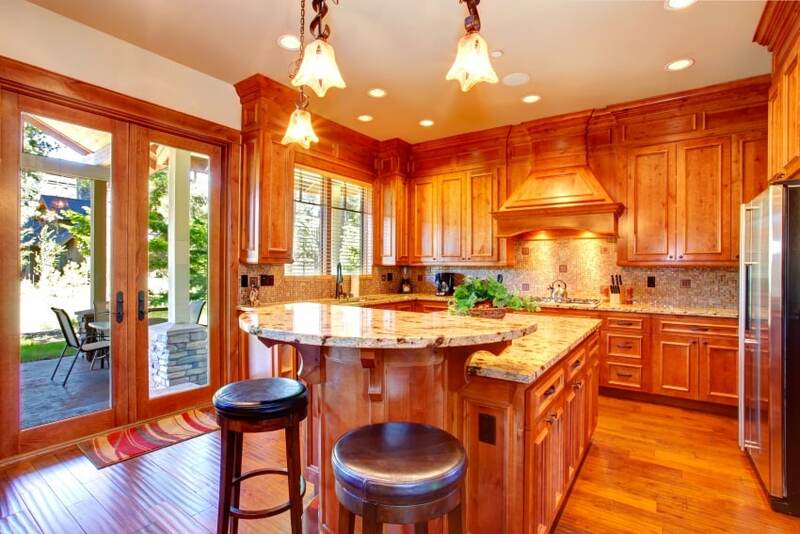 This traditional kitchen looks warm and inviting thanks to the wide use of natural wood in the flooring and cabinetry. The soft rug by the island counter further enhances the sense of comfort. A well-lit setting is guaranteed by the recessed lights in the ceilings. 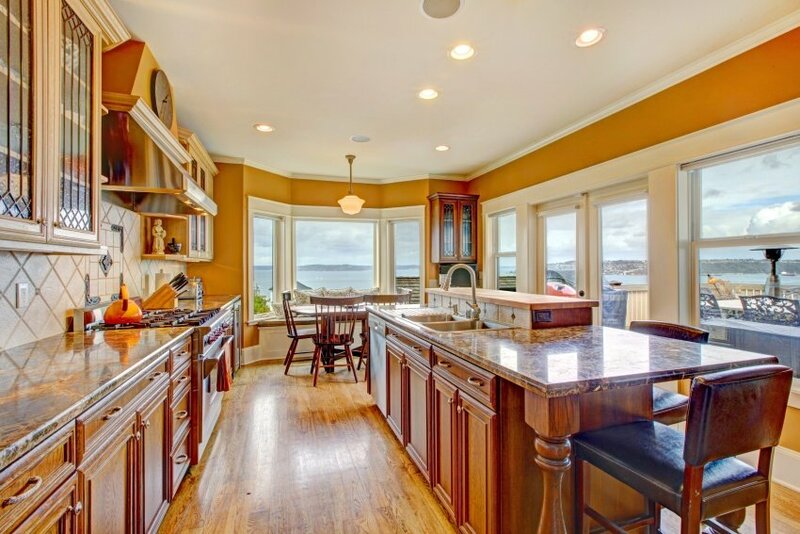 This vast kitchen features all amenities and a variety of door styles ranging from shaker doors, to flat panels and gridded glass. 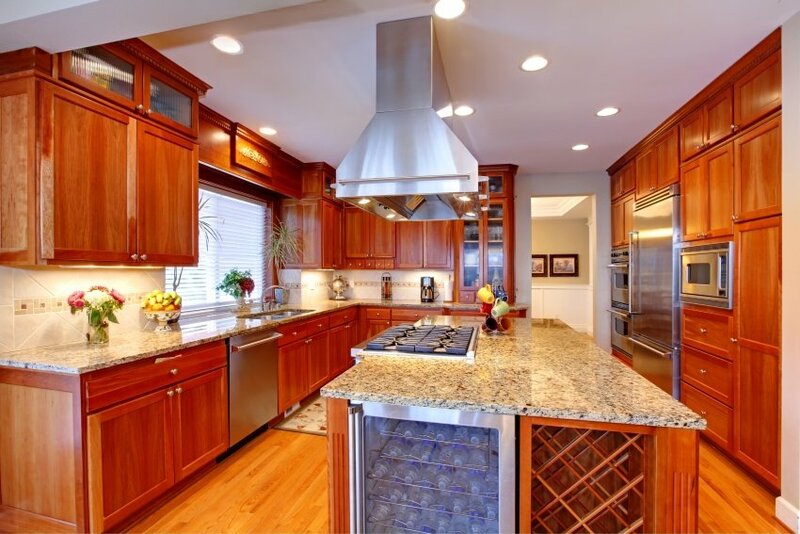 Wood cabinetry in warm colors is what makes the setting particularly cozy and appealing. 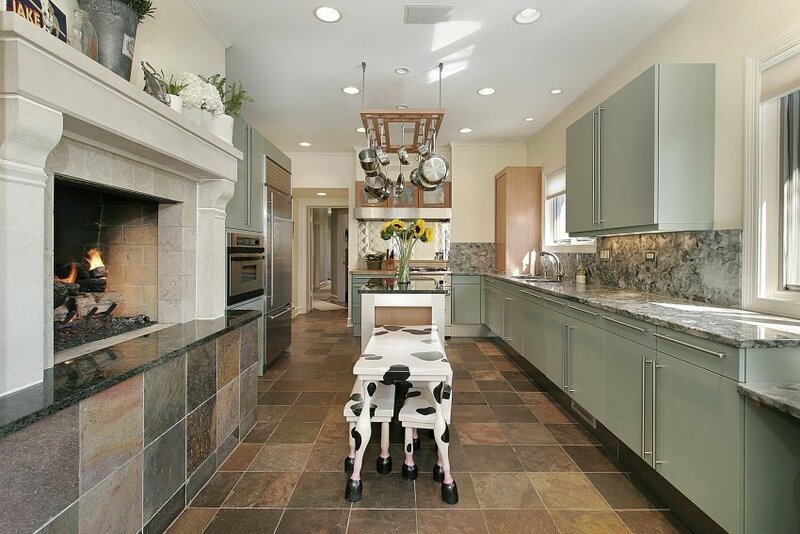 Speckled granite and ceramic floor tiles are in tune with the overall color scheme. 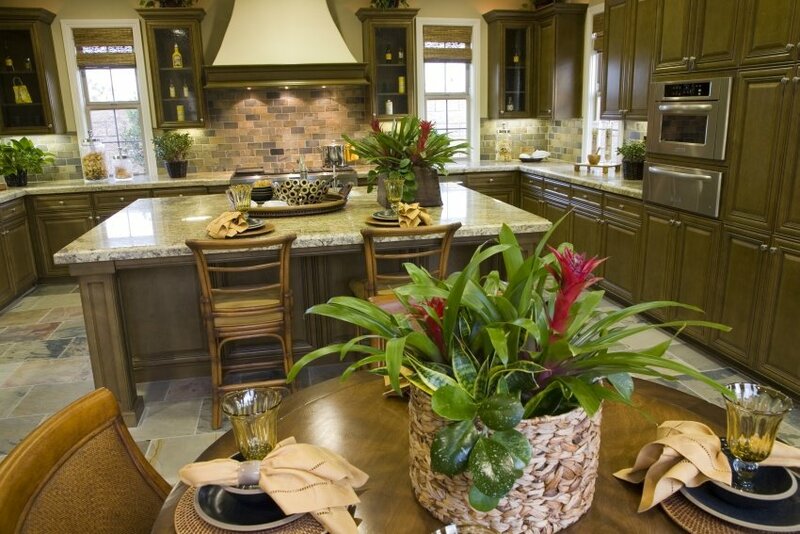 Earth hues are an excellent choice for a luxurious kitchen with a classic look. They go well with light grey cabinetry and white molding. Wrought iron bar stools and bronze pendant lights add a distinct dark accent to a predominantly pale color palette. 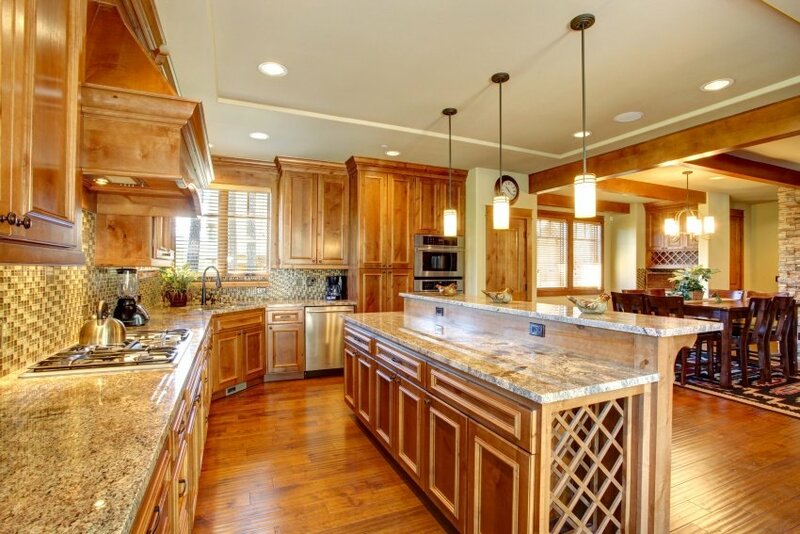 Ample use of wood is a sure way to add a touch of comfort and warmth to a kitchen area. 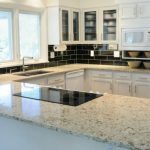 Another classic choice is to top the counters with some speckled granite. A regular design can be broken by a backsplash in decorative mosaic tiles. Here is yet another design proposal in vibrant wood textures. They are matched with some neutral-colored granite countertops and a mosaic backsplash. A nice element in this kitchen is the large glass door that leads out to a lush backyard. Take a look at a convenient design solution for the kitchen area. The kitchen window is a nice spot to place the sink by, and the kitchen island is a great central location for a large range with a hood. 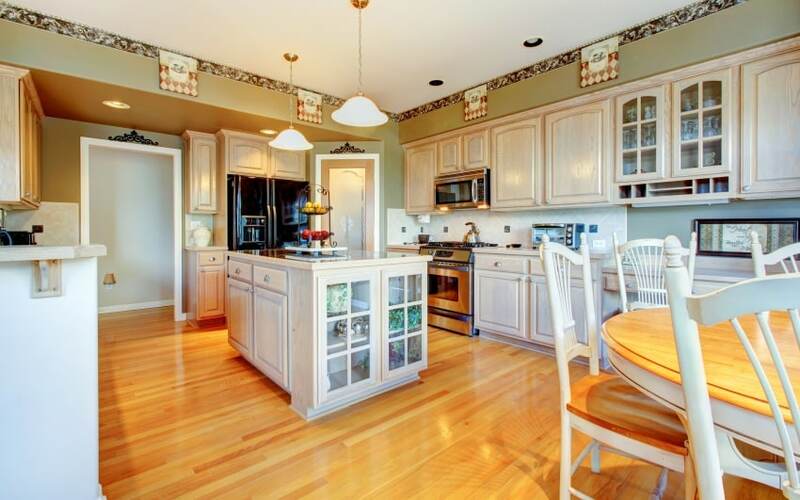 Floor to ceiling cabinetry provides plenty of storage space and is a great place to build in large appliances. 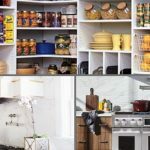 Glass cabinets and criss-cross racks are a break from the regular solid front face of the kitchen and can be beautifully arranged with glassware and fancy wine bottles.